Joining a group Sun Peaks Paint Night, or planning your own custom, private paint night with popular local Sun Peaks artist, Liz Derksen, as your host, is a fun and unique Sun Peaks activity and a great way to spend an evening sharing the inspiration and beauty that surrounds us at Sun Peaks Resort. Chances are, if you're staying in Sun Peaks, or have visited a local Sun Peaks hotel, restaurant, or gift shop like Alpine Images or the Lone Wolf Gallery, you have already seen the unique and colorful artwork of Liz Derksen. 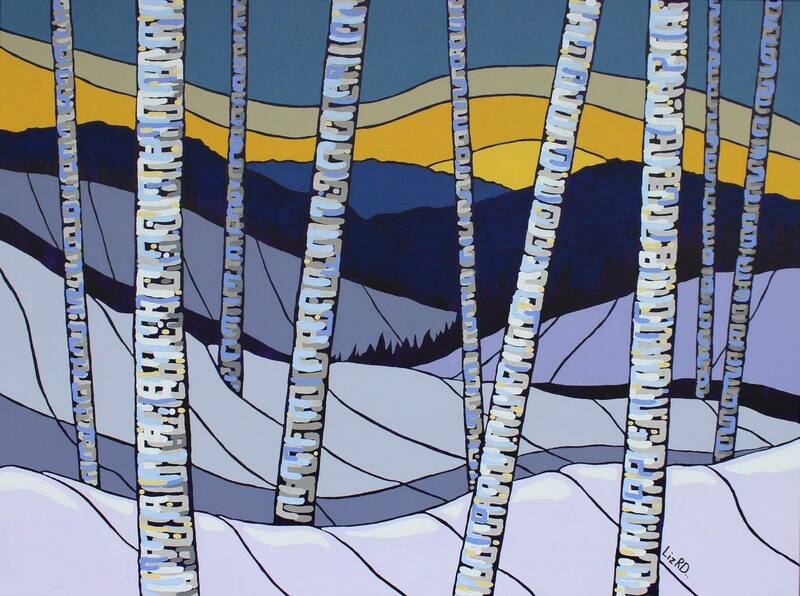 Liz is a popular Canadian artist who lives and works from her home studio in Sun Peaks. Her distinctive artwork is easily recognizable, and is all inspired by her regular walks and snowshoe adventures in and around the resort area. Like Nancy from BestSunPeaks, who is also an artist, Liz sees and captures the natural beauty in the simple things that others may not even notice as they pass by. Local Sun Peaks wildlife, colorful summer wildflowers or fall foliage, sparkling champagne powder falling gracefully from the sky, snow covered stumps, 50 shades of grey clouds or green trees, or peaceful, moon-lit corduroy ski trails are just some of the scenes that may inspire Liz. Grab your imagination, a few friends and a bottle of wine or two, and book yourself into one of the regular Paint Nights at Sun Peaks, and be inspired and encouraged by Liz, others in the group, and the beauty that is hidden as well as in plain sight at Sun Peaks. 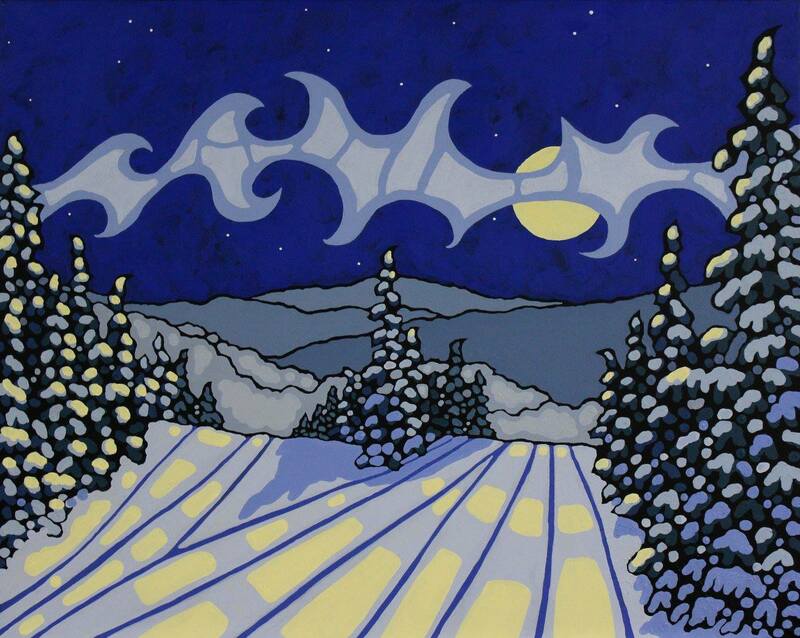 Or plan a special evening with friends, family, and of course Liz Derksen for a custom, private Sun Peaks painting party. 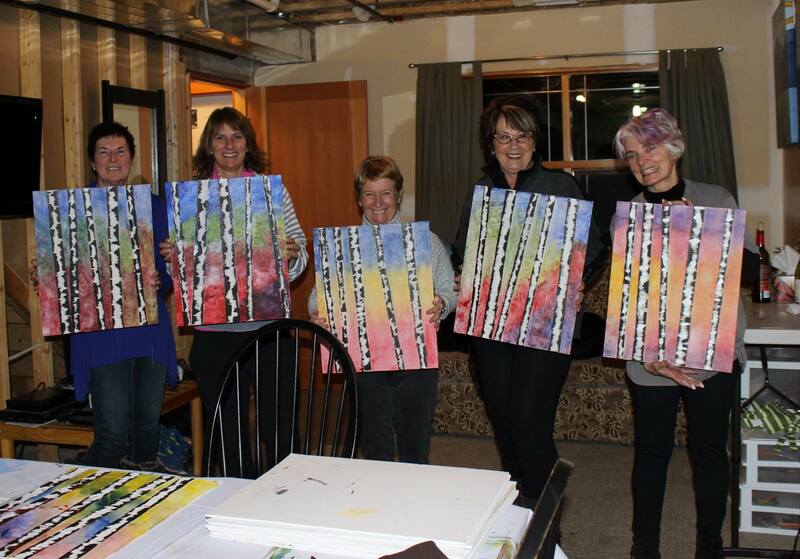 Your group can come to her studio which is just minutes away from Sun Peaks village, or Liz can come to your Best Sun Peaks accommodation to host an entertaining private painting party. Paint supplies are included both in her studio or if she comes to your home at Sun Peaks, and inspiration and personal guidance is provided by Liz. Laughs and good times are free! Bring your own 'refreshments' and prepare to have a wonderful, fun, and unique evening with this trendy new social activity. The price is only around $35 per person, and you will leave after a fun evening with wonderful memories as well as your priceless piece of Sun Peaks art. For timing and availability of weekly Sun Peaks Paint Night group sessions, or to plan your own private paint night with Liz, complete and submit form below and Liz Derksen will be in touch.